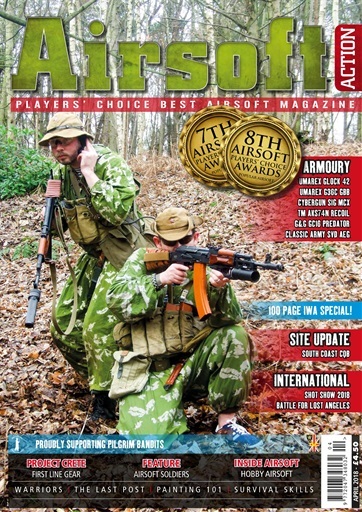 Welcome to Issue 86 of Airsoft Action - a 100-page issue of the Award Winning Airsoft magazine! At the start of every year, there are two shows that are important to airsoft: SHOT in Las Vegas and IWA in Nuremberg. 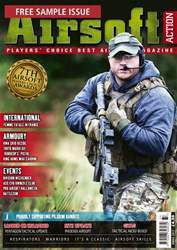 They are huge and Airsoft Action is on the ground to bring you all the latest from both, starting with Kelly's four-page SHOT Show report in this issue. Kelly also brings us another report from the USA, as she took part in Jet Desertfox Airsoft's innaugural event "Battle For Lost Angeles", where smartphone technology was an integral part of the gameplay. We know you love your guns and we have a superb selection of six for you to drool over... SIG MCX, Glock 42, AKS74N Recoil, GC16 Predator, SVD AEG and G36C GBB. Lez Lee chats to Cybergun's recently appointed UK distributor, Hobby Airsoft, and discovers this Irish company has big plans for the future, while Bill Thomas continues our international coverage as he speaks to Toloks Club Airsoft Merida, in Mexico. "Warriors" is always a popular feature and in this issue, Gadge Harvey pulls out all the stops with a superb 5-page article about Soviet "Stinger Hunters" in Afghanistan, before joining forces with Tom Hibberd in our first ever Quiz as, with tongues planted firmly in cheeks, they ask "How "Operator" Are You?" Tom also gives us some advice and guidance on how to paint your gun without spending a fortune. Elsewhere, Matt Fury-King tells Bill Thomas how he creates his unique "airsoft vehicles", Lez takes a return visit to South Coast CQB and discovers a site where disabled players are more than welcome, new French contributor and airsoft sniper, Groquick, gets his hands on a couple of thermal vision products and Frenchie tries to keep his blood pressure under control as he writes about the (anti-)social phenomenon known as "chairborne warriors". There's loads more in this 100 page issue of your favourite airsoft magazine, we hope you enjoy it!